At Lancaster Foods it is our mission to provide the highest quality produce at the best prices on time, every time. We employ an experienced team of Quality Control and Food Safety experts to ensure that the products we deliver to you are safe and enjoyable. Service to you, our customer, is what drives our team of nearly 700 dedicated employees. We endeavor to create a good, safe workplace for our employees to eliminate workplace accidents and employee downtime. Simply put, it is our pursuit of excellence that drives us. Best Quality. Fastest Service. It’s not an adage. It’s a commitment to a set of forward-thinking values that allows us to cultivate meaningful relationships that bring satisfaction to our customers. 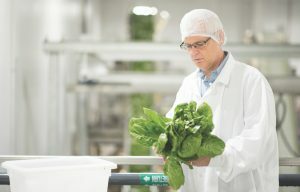 Lancaster Foods President John Gates inspects product in the Fresh Cut Room.